McLibel is the unlikely but true story of how a pamphlet called "What's Wrong with McDonald's?" led to the longest trial in British history. In what has become front-page news around the globe, the trial pitted the multibillion dollar corporation against five members of London Greenpeace accused by McDonald's of libel. Three activists capitulated and apologized; two persevered. 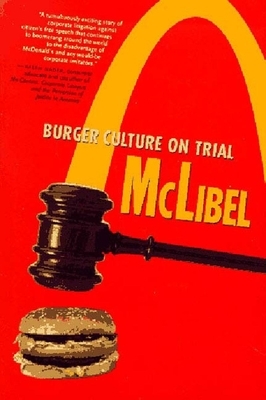 McLibel tells the story of the "McLibel Two" and the two-and-a-half-year trial in which the jeans-clad and impoverished defendants represented themselves against the best powdered-wig lawyers McDonald's could buy. Does the fast-food chain exploit children? Depress wages? Level South and Central American rain forests? Subject its cattle and chicken to mass slaughters? A final chapter explores these allegations and details the $98,000 verdict against the activists Morris and Steel, which is widely viewed as a moral victory for the defendants and a public relations fiasco for McDonald's. Environmental reporter John Vidal covered all two and a half years of the trial. In the tradition of Michael Moore's Roger and Me, he brings this David and Goliath story to life, shedding light on the corporate machinations of a secretive multinational company, the British legal system, and the implications for any individuals inclined to critique a $30-billion-a-year powerhouse. John Vidal has been a journalist at the London Guardian for twelve years, as environmental editor for the past six years. He has twice won national Environment Journalist of the Year awards.